Condo and apartment living comes with a lot of built-in conveniences. Unfortunately, most won’t allow you to have a propane or charcoal grill on the deck. Yet most will allow you to use electric grills. Many of the units you find for sale online and in stores are little more than overgrown versions of the well-advertised George Foreman. While they might indeed make meat hot and make some grill marks, they don’t really replicate the smoky taste of grilled meat. Most even have a nasty habit of tripping a smoke alarm when used indoors. 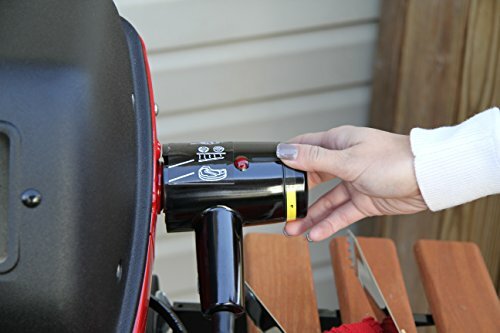 The 9329W9 Easy Street Electric Cart Grill comes with two folding side tables that are made from composite-wood and also have some basic tool hooks. It also includes a shelf for holding a prep or serving platter. The shelf also helps secure the cart’s legs together to make it a little sturdier. Easy Street also attempted to take it a step further and included a built-in rotisserie. 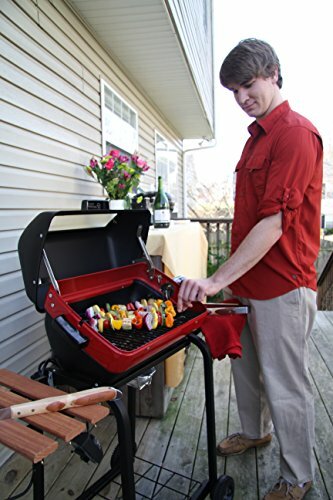 The grill can also be set at three different positions to provide you with superior heat control. Just keep in mind that it is very hard to adjust while you are cooking. So, set the height or the rotisserie in advance, when the grill is still cold. You should also keep in mind that even though it’s an electric grill, it’s not designed to be used indoors. It truly is only advisable to use outdoors and can create enough smoke to stink up a kitchen and trip a smoke alarm. Even though you can remove the fasteners to use it as a tabletop grill, it really is designed to stay attached to the cart base. 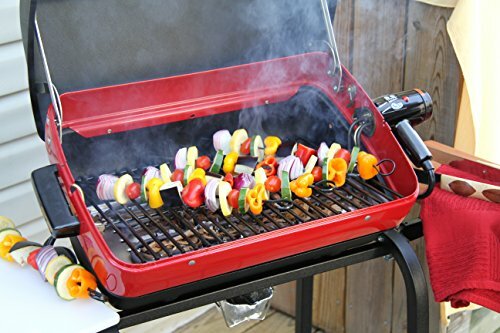 For its price point, the Easy Street Electric Cart Grill is made from relatively durable materials. The glass window built into the lid is nice for monitoring the food without having to constantly open it. The drip tray is a little on the weak side. When it comes to assembly the Easy Street Electric Cart Grill can be a challenge. There are a lot of little parts that need to be put in place with nimble fingers. The rotisserie is more complicated than it needs to be and takes a while to install it correctly. The composite wood side tables and tray might feel cheap, but they tend to hold up better than say treated wood. Being able to fold the trays down helps if you live in an apartment where deck space is at a premium. 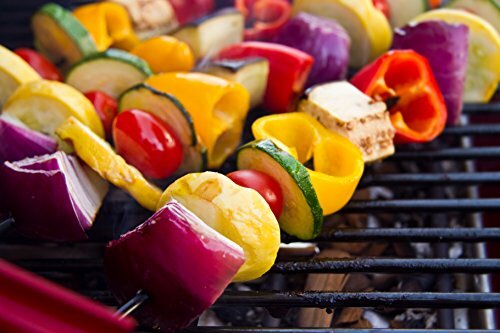 It’s worth keeping in mind that some apartments and condos that do allow outdoor electric grills on a deck or patio, might also have certain safety standards. 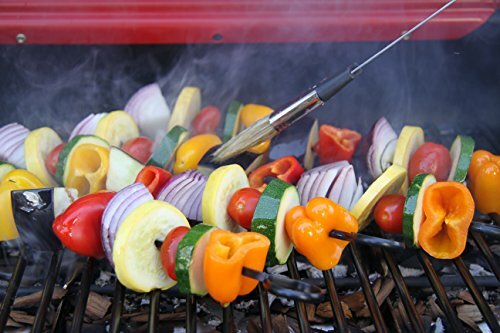 If your grill doesn’t meet these standards, it might be prohibited or could even void your renter’s insurance or affect your lease. The Easy Street Electric Cart Grill’s 1500-Watt electric element is UL as well as CUL-listed! 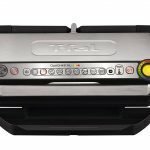 The Easy Street Electric 9329W9 Cart Grill’s three different grilling positions give you some added versatility. It’s very hard to adjust when it’s hot so make sure you have it set up in advance for what you will be grilling. With most grills, a rotisserie feature is very attractive. Some gas and charcoal grills will offer them as an accessory. Yet very few in this price point come with an integrated rotisserie built into the unit. Unfortunately, this rotisserie isn’t the strongest. It will labor to keep turning a small chicken, It might be better to stick to Cornish game hens. You also need to keep in mind that the adjustable grill grates need to be perfectly set in place to be level. If they aren’t you will have round foods like corn on the cob roll away on you. 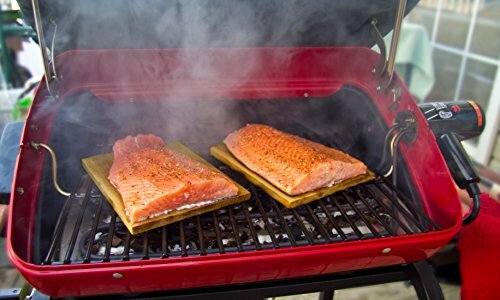 The primary grill grates provide 200 square inches of cooking space. This is enough to make up to three medium-sized steaks or to grill enough hamburger patties to feed a family of four. The integrated rotisserie is technically big enough to handle a broiler-fryer size chicken. Unfortunately, the motor for it is barely strong enough to turn a bird this size. It also has a tendency to burn the skin. The best way to use this rotisserie is probably to turn to small birds like a Cornish game hen. 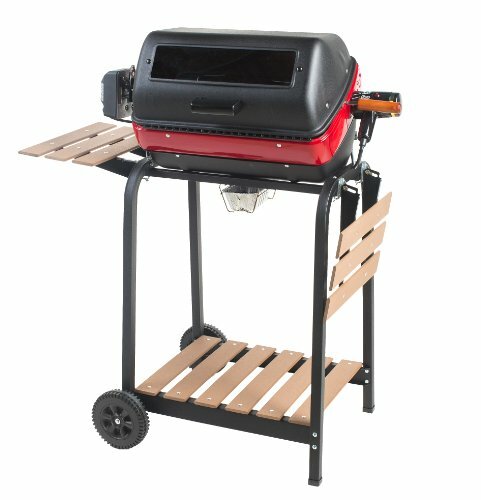 The integrated rotisserie is nice and rare for a grill in this price range. Unfortunately, the motor is a little underpowered. 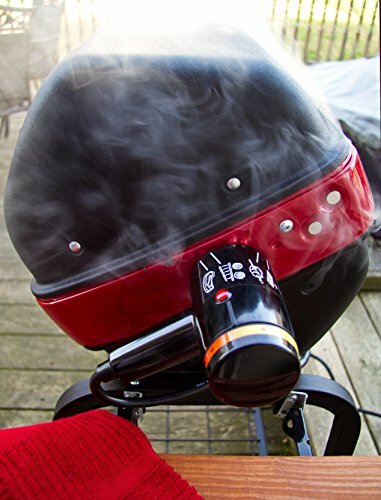 The Easy Street Electric Cart Grill can be a little tricky to clean. They do include specific instructions in the owner’s manual that are worth reading. The disposable drip pans can bend and spill easily and shouldn’t be handled when it’s still hot. If you don’t reuse them, then you will need to order more, which is a small, yet somewhat annoying added expense. The grates can be gently scraped with a stiff nylon-bristled grill brush. The rotisserie can make a bit of a mess in the bottom of the grill. Cleaning away the drippings that are left behind can be a little tricky. A pair of tongs holding folded paper towels might help, without having to stick your hands into the bottom around the electric element. The Easy Street Electric Cart Grill comes with a 90-day warranty, which is a little shorter than you might like for a grill in this price range. Some online retailers will offer an extended protection plan at a reasonable cost. Outdoor electric grills tend to have some limitations. Most tend to mimic the George Foreman grill, or they act like little more than a high-powered electric frying pan with a corrugated surface. 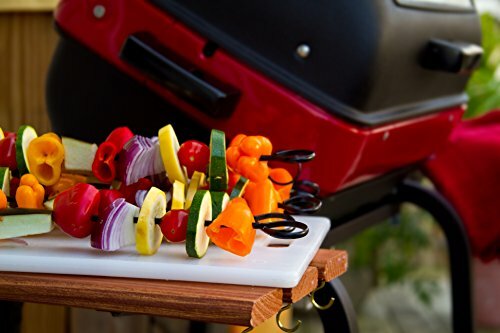 The Easy Street Electric Cart Grill does a good job of replicating the traditional outdoor grilling experience. Just keep in mind that the rotisserie is a little on the weak side. The dripping’s pan is intended to be disposable and you’ll need to clean it thoroughly if you want to reuse it. Three-position cooking element. 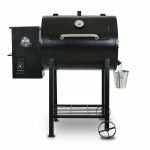 Along with its foldable, wooden side tables and window, this grill's three-position element and rotisserie cater to your every need. 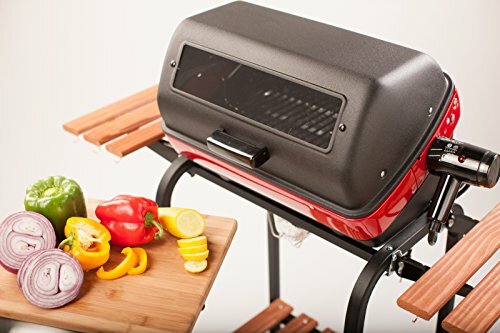 With three heating positions, this grill is capable of (1) creating a zone of even heat for traditional grilling, (2) creating a versatile zone of different temperatures for cooking medium, rare and well-done simultaneously and (3) converting to a fully vertical position for rotisserie grilling. This grill's rolling cart makes it convenient to transport, and its wooden shelf helps keep your grilling materials tog ether.